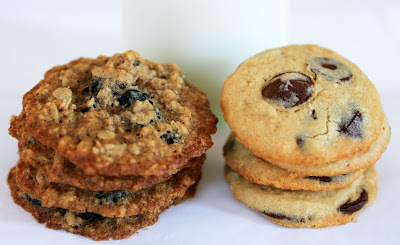 hard-pressed to choose a recipe to bake (so many were my favorites) but I was able to narrow it down to two, Blueberry Oatmeal Cookies and Dark Chocolate Peanut Butter Cookies. With a hint of maple flavor and bursts of sweet blueberry, Tina’s oatmeal cookies were chewy delishness. I loved them. I also liked the peanut butter cookies, but they were very tender and light, and I’m not accustomed to that. 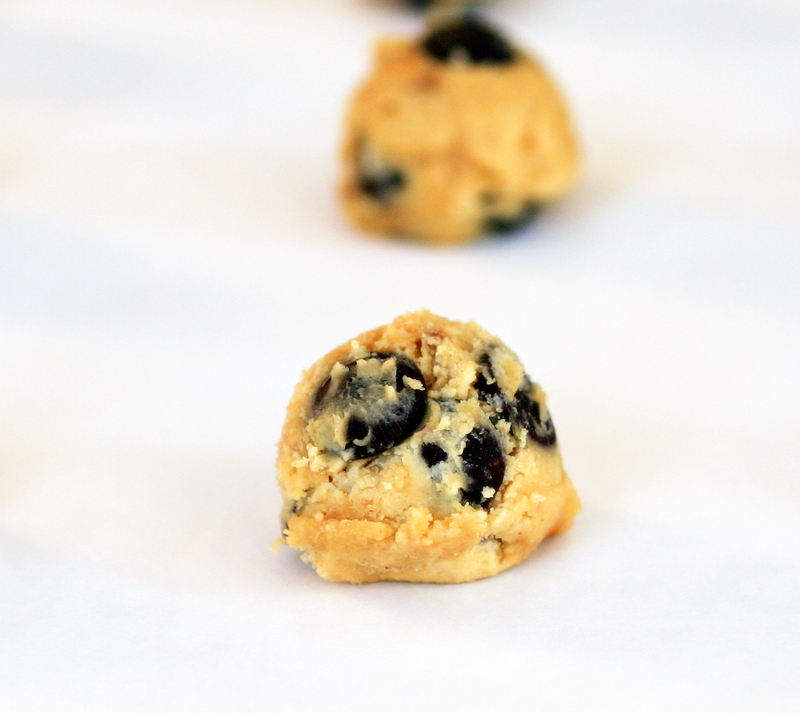 I think I like my peanut butter cookies dense and chewy, but you might prefer them this way. At any rate, I know you will love this book and its myriad recipes. You'll also love Tina, if you get the chance to stop by her charming bakery. 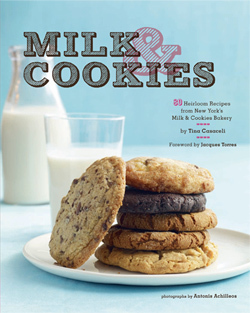 Milk and Cookies Bakery is located at 19 Commerce St., New York, NY; 212-243-1640. 1. Combine the flour, cinnamon, baking soda and salt in a mixing bowl. Set aside. 2. Put the butter in the bowl of a standing electric mixer fitted with the paddle. Begin beating on low speed. Add the brown sugar and granulated sugar and increase the speed to medium, and beat for about 4 minutes, or until light and creamy. Add the maple syrup and eggs, one at a time, scraping down the sides of the bowl with a rubber spatula after each addition. Beat in the vanilla. 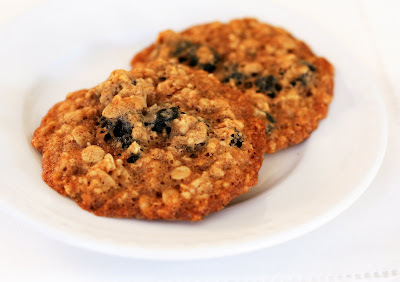 Slowly beat in the flour mixture and oats, then the dried blueberries. 3. Cover the dough tightly with plastic wrap and refrigerate for at least 1 hour, or until firm. When ready to bake, preheat the oven to 350°F. 4. Line two baking sheets with silicone baking mats or parchment paper. Using a tablespoon or small ice cream scoop, make mounds of dough. Roll the dough into balls about 1 ½ inches in diameter. Place the balls, about 2 inches apart, on the prepared baking sheets. Using your palm, gently flatten the top of each cookie slightly. Bake for about 8 minutes, or until golden around the edges. Transfer the cookies to wire racks to cool. Store in an airtight container at room temperature for up to a week. *Note: my grocery store didn’t have peanut butter chips, so I doubled the amount of chocolate chips instead. 1. Combine the flour, baking soda, baking powder and salt in a mixing bowl. Set aside. 2. Put the butter in the bowl of a standing electric mixer fitted with the paddle. Begin beating on low speed. Add the brown sugar, increase the speed to medium, and beat for about 4 minutes, or until light and creamy. Add the peanut butter and beat to incorporate; then, beat in the eggs, one at a time, scraping down the sides of the bowl with a rubber spatula after each addition. Beat in the vanilla. 3. With the motor running, gradually add the flour mixture, peanut butter and chocolate chips and chopped peanuts, beating just to blend. While the dough is still streaky, remove the bowl from the mixer and scrape the paddle clean. 4. Cover the dough tightly with plastic wrap and refrigerate for at least 1 hour, or until firm. When ready to bake, preheat the oven to 325°F. 5. Line two baking sheets with silicone baking mats or parchment paper. Using a tablespoon or small ice cream scoop, make mounds of dough. Roll the dough into balls about 1 ½ inches in diameter. Place the balls, about 2 inches apart, on the prepared baking sheets. 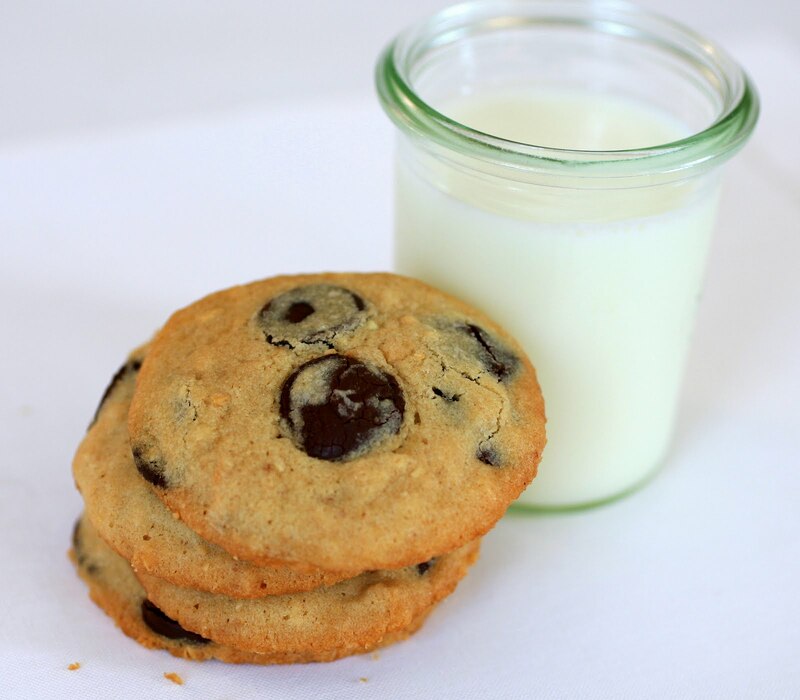 Using your palm, gently flatten the top of each cookie slightly. Bake for about 8 minutes, or until golden around the edges. Transfer the cookies to wire racks to cool. Store in an airtight container at room temperature for up to a week.